For all he's been through in life, Blue Wahoos pitcher Devin Smeltzer readily admits wearing his heart on his sleeve. 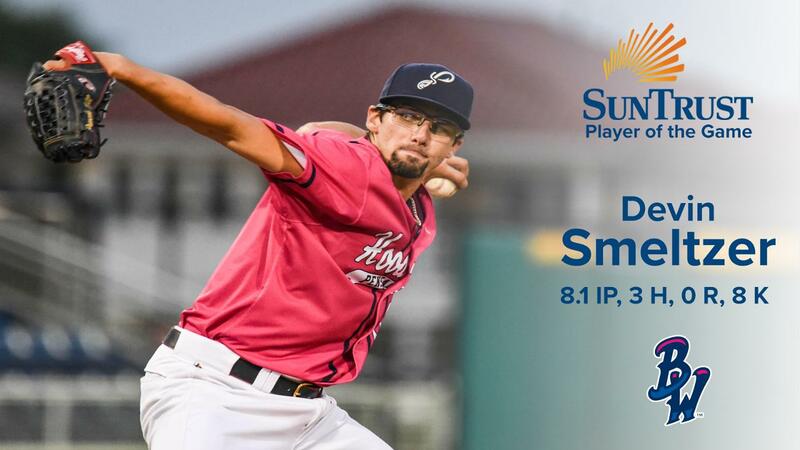 A mutual feeling was experienced Friday night, as a sellout crowd of 5,038 in Pensacola showed its love watching Smeltzer produce a memorable gem in a 2-0 shutout against the Jacksonville Jumbo Shrimp. Smeltzer, 23, a New Jersey native who overcame cancer at 9-years-old and strengthened his body from frailness to soundness, worked a near-complete game that was played in less than two hours. When removed with one out in the ninth inning, fans stood in resounding cheer as Smeltzer exited off a stage he owned at Blue Wahoos Stadium. The win clinched the series for the Blue Wahoos 6-2. "The emotions out there, that's what I feed off of," said Smeltzer, after allowing just three hits while striking out eight and facing just two batters above the minimum over 8.1 innings. "I know there is a fine line between too much and too little, but for me it is just riding that line and catching the emotions from the fans. "I have pitched with no fans before and it's tough. Having people behind you is everything. The people in Pensacola,I can't thank them enough. Look forward to the next one." The current one followed his past superlative performance. He was part of a 5-0 shutout win April 6 in Mobile, taking a perfect game into the fifth inning. In two starts, he's allowed no runs, just five hits and two walks, and has rung up 17 strikeouts. "The first outing was really the good, but this one was unbelievable," said Blue Wahoos manager Ramon Borrego. "That was fun to watch. He worked well with off-speed pitch and his fastball in and out. It was great to see. His fastball has got a lot of movement and the way he mixed that with his breaking pitches was good. He is a smart kid. He knows how to pitch." Smeltzer knows how to style, too. He had fans talking about his throwback leg pants with the stirrups in a look from a half-century ago. "I've pitched with stirrups since I was a kid," Smeltzer said. "I have always been old school. Just a hard-nosed ballplayer." Coming to Pensacola as part of the Minnesota Twins organization has benefited him in another way. One of his best friends from childhood is stationed at Naval Air Station-Pensacola training as a pilot. His other roommate is also a U.S. Navy flight school member at NAS-Pensacola. During tonight's gem, the Blue Wahoos defense was behind Smeltzer from the beginning. Centerfielder Tanner English, who was just activated from the injured list before tonight's game, made two diving catches and drove in the Blue Wahoos second-inning run. The team's penchant for fast starts continued Friday when Jordan Gore led off the first inning with a single. Luis Arraez followed with a single. Taylor Grzelakowski's slow roller in the infield then allowed Gore to score the game's first run. It was the eighth consecutive game during which Pensacola has scored first. In the ninth inning, Borrego opted to let Smeltzer face the first batter, which English helped retire on a sensational catch. He then came out to make the change, allowing Smeltzer to get the standing ovation from the home crowd. Cody Stashuk came on to retire the next two batters, ending the game on a strikeout. "He had seven pitches left on his pitch count," Borrego said. "I said, 'Just give me one out.' I love a guy like that, because you can see they care about the game. They love the game." -Pensacola Fireman Rick Simmons was honored by the Blue Wahoos on his final night working as EMT a the ballpark. Simmons is retiring after 30 years with the Pensacola Fire Department. His son, Keegan, is part of the Blue Wahoos game-day staff. His daughter Mackenzie and wife Jennifer joined him on the field as Simmons threw out the first pitch, which he dubbled "The Firefighter Floater." -Fans attending Friday's game received Blue Wahoos hats, courtesy of game sponsor LandrumHR. The Pensacola company works with other local companies for staffing and other personnel needs. -Saturday's game against Jacksonville will start at 6:05 p.m. and feature the first post-game fireworks display following the game. Air Force Second Lieutenant and Blue Wahoos pitcher Griffin Jax is scheduled to start. -Sunday's game is scheduled for a 1:05 PM start.